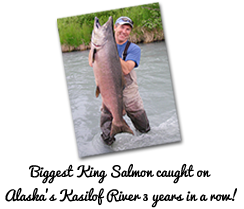 Kenai Outfitters have terrific fishing guides with tremendous river fishing knowledge, excellent drift boat skills, and the patience to teach us the intricacies of King salmon fishing. - Boise, ID. Check Out Our Fishing Peaks And Salmon Runs To Pick The Best Time To Book Your Alaska Fishing Trip. Choose The Best Time and Let's GO Fishing! Don't Miss The Boat This Summer! That Monster Alaska King Salmon!